Unless lanterns look good attached to walls like torches and can be made and used in abundance. They can be reignited with Flint and Steel. It's fine as long as torches last a couple of days and lanterns are more powerful/not super expensive to make. Maybe 4x more material consuming than torches? I believe that was the original plan, yes. Needless effort, especially for people who place torches on the outsides of structures and at great heights, etc. Climbing out to reignite would be silly and annoying and completely remove the great lighting effects that bring your structures to life at night and/or add a horribly tedious element to the playing experience. Not to mention torches are good to mark caves you've explored, etc. There are too many unknowns to decide how terrible the torch change is. How much better is the lighting power of a lantern vs a torch? How expensive will the lantern be to make? How long will torches last before burning out? 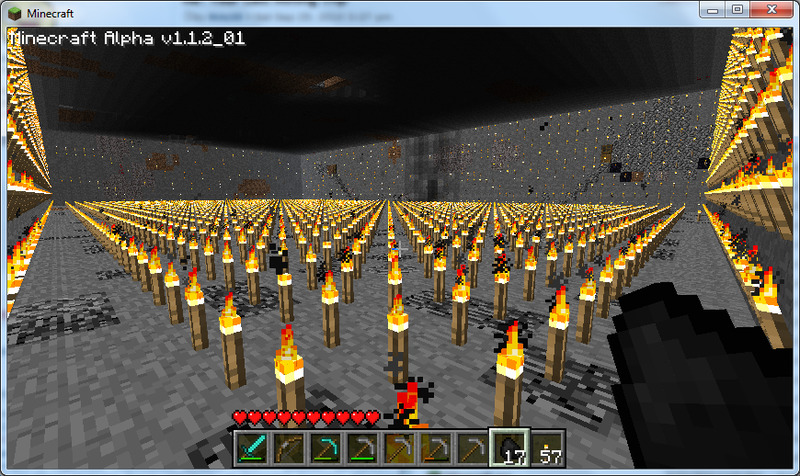 I'm scared of the dark, so go through torches like nothing when exploring caves - like one every three blocks. The best part is I can quickly make more whenever I need because the default 2x2 crafting area is fine for making torches on the run without having to set up a workbench. Putting lanterns in the mix will definitely change my spelunking habits. For better or worse is too soon to tell. I wouldn't mind it. I like using lava as a source of light. This is an awesome change. It makes the game more difficult and prevents turtling in your base. Hard mode should be hard. Eh, I don't really mind. You can still use torches to mark caverns, just add a spare lantern every 10 torches or so and bring Flint and Steel. Since torches don't disappear, just get extinguished, it's not that bad to only use lanterns where you need constant lighting. I guess if this torch change is coming and he is adding lanterns, both of which I am fine with, I would like to have the ability to carry a lit torch for light while I work in to caves. I think the change is perfectly fine, since all torches are being replaced. I find it to be a terrible idea, personally. I like that MC hasn't been realism to the point of gagging. But, whatever. If Notch plans it, it'll happen. So I'll just take more time to stock up on the idiotic lanterns and use them instead. Gonna look stupid having a mine full of lanterns, but I like securing mines once rather than 50 times over. It's just a pointless and needlessly frustrating change. A million other better changes or ideas could come in to play over this, and if lanterns look silly or simply can't be placed on wall facings or the like, then I almost wouldn't want to play if i can't light up my structures or are forced to spend pointless time reigniting torches. Then use a lantern for those things instead. I mean, Peaceful is the ***** mode, we shouldn't worry about torches going out in that mode. But I think they'll go out anyway. Just my opinion --- I don't think Notch will work with that.